We can accept order for Bambicrony regular doll at anytime, not just during pre-order session. Pre-order for Bambicrony products only. *No additional shipping fee from DayDream will be applied to your order. *Custom fee and import tax will be charged only if there are. Please submit your order to e-mail; pupacasa@gmail.com . For international customers, please contact us by e-mail about payment in US dollar and PayPal information. 2. 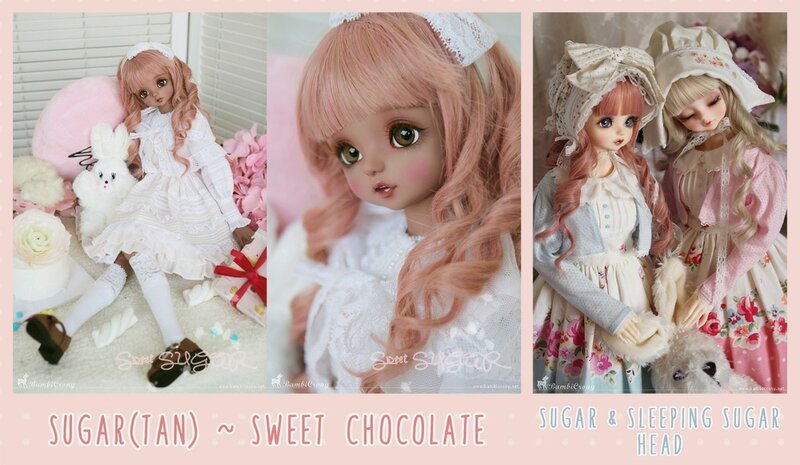 BZ Sugar & Sleeping Sugar are available to order just head only in Normal, White and Tan skin. - Registered post for non-assembled doll and accessories only. * 50% deposit. The rest + shipping fee when items arrive. - We will inform you prior to closing date if there's any change or problem. - We won't accept any change or cancellation after order has been sent to Bambicrony. - We won't refund if you decide to cancel your order after order has been sent to Bambicrony. - Please promptly inform us if you are not able to make payment within our payment period or your order will be automatically canceled. - Due to method of ordering as dealer is complicated and not as convenient as normal customer, it may take more waiting time than normal order through Bambicrony website as normal customer. Sorry for inconvenience. - Please feel free to let us know if any question.